–“I Feel the Earth Move” (King, 1971, track 1). Carole King could be describing a myriad of states: falling in love, twisting and turning at the amusement park or simply rolling out of bed. The sensation of vertigo, and its counterpart BPPV, can cause those affected to feel as if the earth is truly moving under their feet! These sensations can come and go, strike without warning, last from merely seconds to days (or longer) and leave us feeling out of control. But what can we do? And how can a physical therapist help? These feelings may occur when changing position such as when turning your head, bending over, rolling in or out of bed, or may even come on when standing perfectly still! You might also experience feelings of nausea, abnormal or jerking eye movement, headaches, sweating, ringing in the ear or hearing loss. Vertigo may occur due to a number of causes. These include BPPV (as detailed below), Meniere’s disease, viral infections within the inner ear, head or neck injuries, neurological issues such as stroke or tumors, migraine headaches and damage inflicted upon the inner ear. Benign paroxysmal positional vertigo (BPPV) can occur when tiny crystals (calcium carbonate particles called canaliths) become dislodged from their normal location and enter or clump within the canals of the inner ear. When these crystals move they can stimulate nerve endings that cause you feelings of dizziness. 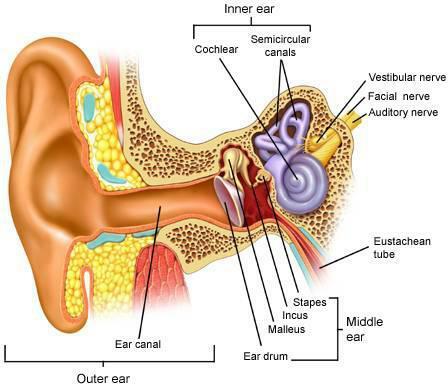 This occurs in the area of the inner ear detailed in purple above. This inner ear problem creates sensations of vertigo but causes more acute periods of dizziness specifically when your head is moved in certain positions such as when lying down, turning over in bed or looking up. Currently BPPV occurs without any known reason but has been associated with trauma to the head. Treatment for vertigo greatly depends upon its cause. In some instances, vertigo will simply “go away” because your brain has learned to adapt and rely upon other mechanisms to maintain your body’s balance. When it persists, vestibular rehabilitation can help! This is a branch of physical therapy that aims to strengthen the vestibular system (pictured above). Rehabilitation includes managing symptoms of dizziness and imbalance while improving strength and flexibility with customized exercises. Treatment plans are developed after an initial evaluation to determine the cause of vertigo, then tests and exercises are recommended for management. BPPV carries its own specific tests and treatment to help patients recover. These include different methods of specific head movements to dislodge the inner ear crystals; methods such as Canalith Repositioning Maneuvers and the Epley Maneuver. While most physical therapists are trained and educated to treat dizziness, there are specific training courses focused on vestibular and BPPV disorders and its treatment. At Lafayette Physical Therapy, physical therapists Valerie Watase, PT and Alison Clark (Schienbein) PT, DPT have additional training in vestibular rehabilitation and have helped many patients with vertigo, BPPV as well as many other types of orthopedic and neurological conditions. You may want to consider seeing a physical therapist with experience and training in vestibular rehabilitation when seeking physical therapy for vertigo or BPPV. Physical therapy aims to restore and improve strength, function and movement. Ask a physical therapy what physical therapy can do for you! [Anatomy of Vestibular System]. Retrieved from http://www.malonie.com/health/vestibularsystem/. [Anatomy of Inner Ear]. Retrieved from http://www.lakesideaudiology.com/hearing_health.php. Bloom, PT, DPT, M., & Wellmon, PT, PhD, NCS, B. (2011, June 3). Physical Therapist’s Guide to Vertigo. Retrieved July 24, 2015. Herdman, PT, PhD, S., Hoffman, PT, DPT, S., Thompson, PT, DPT, M., & Wellmon, PT, PhD, NCS, B. (2011, May 10). Physical Therapist’s Guide to Benign Paroxysmal Positional Vertigo (BPPV). Retrieved July 24, 2015. Ratini, DO, MS, M. (Ed.). (2014, December 23). Vertigo: Causes, Symptoms, and Treatment. Retrieved July 24, 2015.